No matter what you're doing, your body is burning calories. The amount of calories your body burns at rest with no added exercise is known as resting metabolic rate. If you want to lose weight, you need to eat fewer than the number of calories your body burns naturally, indicated by your resting metabolic rate. If that seems difficult, you can also burn the extra calories through cardiovascular exercise. The elliptical trainer is a cardiovascular exercise machine with which you may burn a significant number of calories in one daily exercise session. Weigh yourself to begin your resting metabolic rate calculation. Once you obtain your weight in pounds, multiply your weight by 6.25. For example, if you weigh 150 pounds, multiply the number by 6.25. The result is approximately 938. Measure your height in inches. Once you obtain your height, multiply it by 12.7. For example, if you are 68 inches tall, multiply 68 by 12.7. The result is approximately 864. Add the two numbers obtained together. In this example, 864 + 938 = 1,802. Multiply your age by 6.76, then add 66 to the total. If you are 50 years old, you would multiply 50 by 6.76 to obtain 338 and add 66 for a total of 404. Subtract the result you obtain from your height and weight formulas from the number you obtained from your age formula. Continuing the example, 1,802 - 404 = 1,398. Multiply the total by 1.1. In this example, the total is 1,538. This is the resting metabolic rate -- the number of calories the body in this example burns at rest. To lose weight, you must consume fewer calories than this number, or exercise to create a caloric deficit. Determine how many calories you will burn in 30 minutes on an elliptical machine. The number varies based on your weight and age, so use a calorie calculator. As an example, an 140-pound person burns 500 calories on an elliptical in just under 40 minutes. Engage in exercise on the elliptical machine for at least the amount of time indicated on the calculator. Many elliptical machines have a timer and a calorie counter. 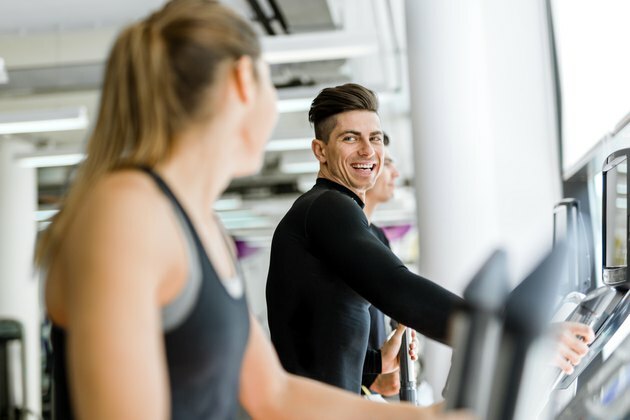 Because different elliptical machines are manufactured using different materials and maintained differently from location to location, plan on spending slightly more or less time on the machine than the calculator indicates. Engage in interval training to diminish the amount of time it takes you to burn 500 calories. If you temporarily move faster or increase the machine's resistance, you will burn more calories quicker. How Many Calories Do I Burn a Day by Just Existing?